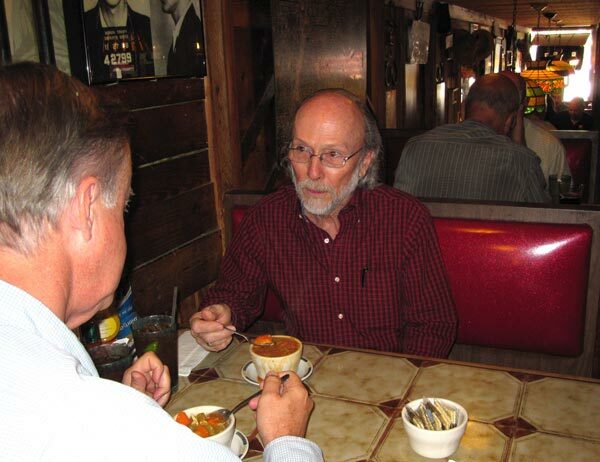 Russell, Joyce & Wade Langley have been eating here since 1974 when it was the Suniland Luncheonette. “Wagons’ food is consistently good, the coffee is wonderful, Walter is a great guy and the staff is marvelous,” said Joyce. My wife's family, the Morrisons, have been eating at Wagons since it opened in 1981. Before I moved to Miami, they would proudly take me to Wagons West, calling it South Florida tradition. Wagons West is a “water cooler” spot. Even more than the great American food, it's the place for local news and gossip. It's impossible not to be recognized and warmly greeted when you walk in. There’s a strong sense of consistency and staying power, punctuated perfectly by the original redwood outdoor sign which now proudly hangs over the kitchen area. The owners, Walter and Steven Muench, came to the United States from Germany in 1958. They moved to South Florida in 1971 and operated two restaurants that preceded Wagons West. From 1981 to 1989, the two brothers cooked everything at the restaurant themselves. Walter (or Wally as most people call him) looks back on those days with pride and satisfaction. “There was nothing like working the kitchen and turning out great food for all my patrons. Their smiles and support was all I needed to know we’d done good.” Brother Stephen retired in 2010, but Wally continues the family tradition. To this day, Wally is comfortable in his restaurant and he’s made countless others comfortable as well. The staff, who are more like family, are Saturnan Auguste (29 years), Dawn Crawly (10 years), Lin Farres (14 years), Vanessa Gomez (17 years), Joan Greenberg (8 years), Stephanie Keough (3 years), Laura Kurucz (8 years), Sandy Lenhardt (20 years), Danielle Penny (6 years), Susan Schroder (18 years), Vivian Schroder (10 years), Beppi Steele (20 years), Rachel Thibault (10 years), Joan Weinstein (12 years) and Freeman Williams (10 years). Once you’re in, you unlikely to leave. To the patrons, the staff is what makes Wagons West so special. As someone who regularly sits down for a good Wagons West meal, I can attest they take care of every customer every day. There’s nothing quite like getting my Wagons fix. If you're in the area, I highly recommend you grab some good American food and soak in a little bit of Pinecrest. Tell Wally I sent you. You won't be disappointed. Ghosts: Do They Walk Among Us?